When we visited Animal Kingdom last year with Kevin and Renee, we noticed that they seemed to be practicing for some sort of show out on the water. 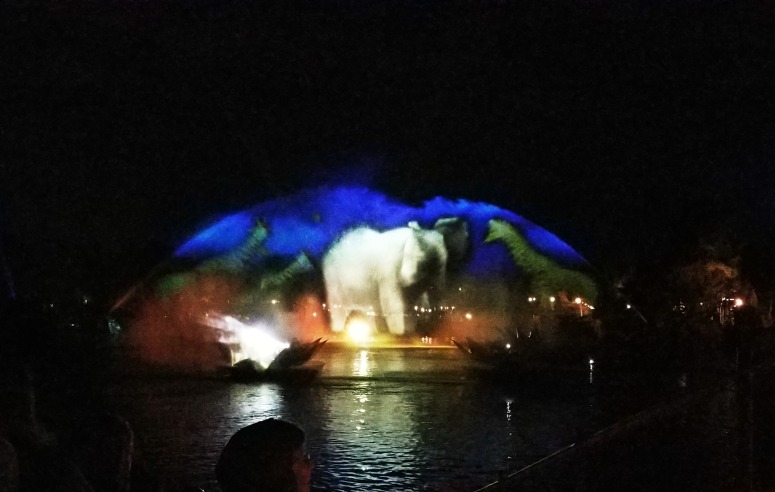 I later learned that they were adding a nighttime show at Animal Kingdom – Rivers of Light. So as I planned our trip this year, Animal Kingdom quickly got added to the itinerary so that we could experience this show. Since this is still a relatively new show, and because I’m not one to sit for 2 hours waiting for the show, we decided to book the Rivers of Light Dining Package which comes with reserved seating. 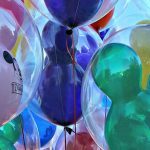 There are two restaurants which participate in the dining package – Tiffins, and Tusker House. 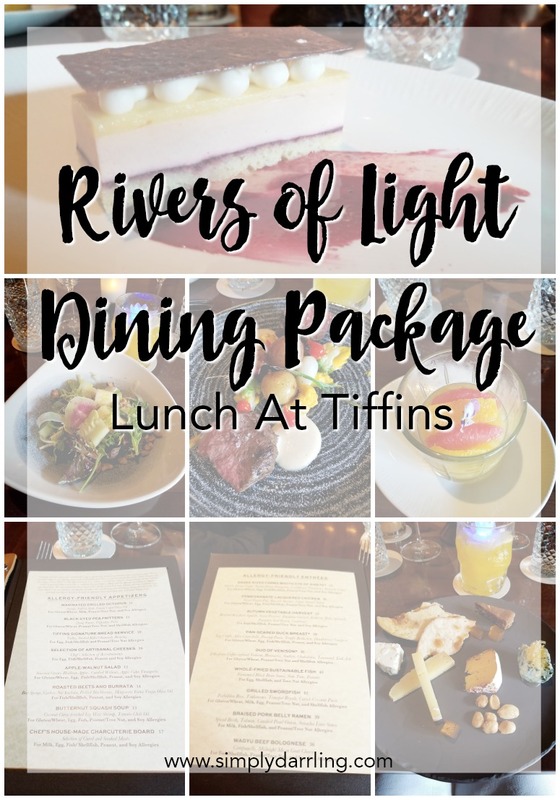 After peeking at the menus, we decided that Tiffins looked like the better Rivers of Light dining package experience for us (especially since we were a party of 2 adults). 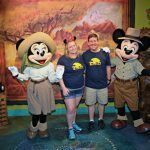 Brad has two allergies – Peanuts and Dairy, but I knew that Disney would be able to easily take care of this, especially after peaking at the menu before booking. The dining package features an appetizer, main dish, and dessert for each person. Brad and I also opted to enjoy a cocktail during our delicious lunch. I forget which one Brad got, but I had the Annapurna Zing which was delicious (and came with a floating lotus light). Since Brad was marked as “allergy” they gave him a special menu. Rather than being a whole separate menu, each item listed which common allergies were safe with that dish. Some items could be modified further if needed (such as peanuts that were sprinkled on top could be removed). For the appetizer, Brad had the Apple-Walnut Salad and I enjoyed the Selection of Artisanal Cheeses. I was in cheese heaven, they were so delicious! We both decided to get the Wagyu beef for our main course. Oh my goodness, talk about a melt in your mouth steak! The only difference between our two dishes was the sauce because one of them was cream based. Brad didn’t quite have as many dessert choices (while he’s not allergic to chocolate, his brain associates chocolate and milk so he can’t eat it, even if it is technically dairy free). He went with the Passion Fruit Tapioca Creme (which was actually dairy free), and I had the mouth-watering Guava Mousse. 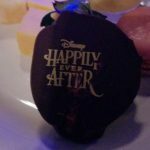 I love fruity desserts, and mousse so this was the ideal dessert for me! 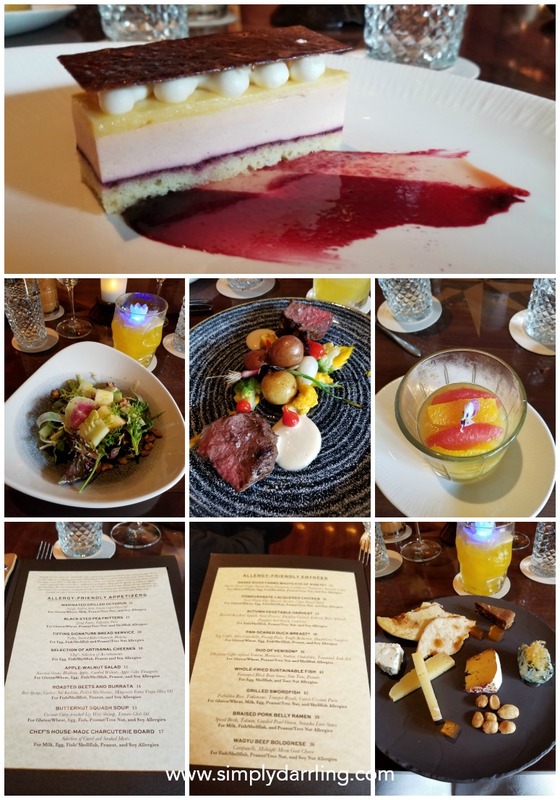 This meal was definitely a treat for us, and was rather expensive (especially for a lunch); however, you also have to take into account the value of your TIME because you have a reserved section for the Rivers of Light show. We arrived about a half hour before the show to get settled into our spots, and the stand-by seating was already pretty full by that point. The Rivers of Light show was absolutely spectacular. 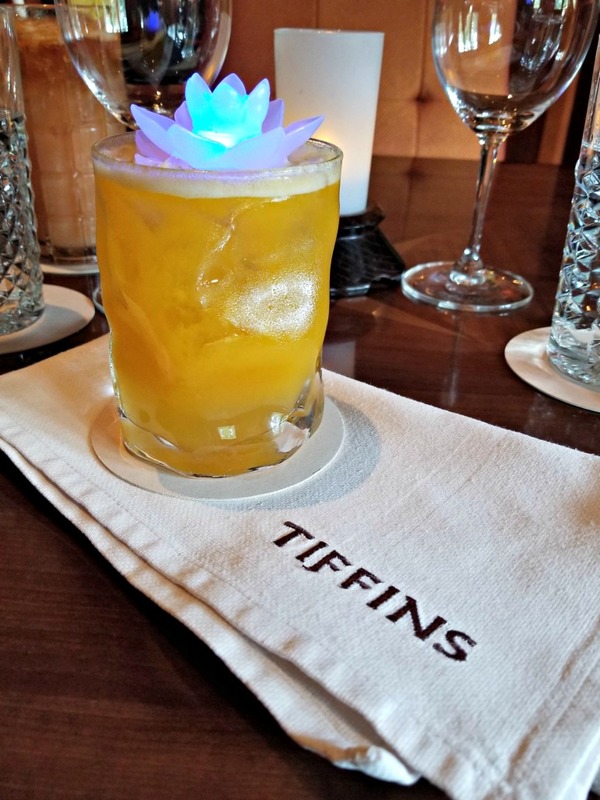 it features floating lotus blossoms (just like my cocktail), bright floating animals, and the most amazing water show I’ve seen. The picture below is projected ONTO water that is being sprayed into an arch. This is such a cool concept and is executed perfectly. Some nights there are two shows a day so your seating reservations will be set for either the first or second show. On the day we were at the park, there was one show at 7:15, and the park closed at 8. Rivers of Light is about 15 minutes long so once the show was over, we headed back over to Pandora to check it out in the dark. If given the chance, I would definitely participate in the Rivers of Light dining package again. The lunch was delicious, and I loved knowing that I didn’t need to worry about getting seats for the Rivers of Light show. Wow, this looks amazing! The show sounds awesome and I love that they can accommodate for allergies so well. Oh my gosh. That looks amazing. How fun! Oh YUM! Everything looks so delicious. It sounds like such a great night, too. The food looks amazing! I’m all about a treat every now and again, especially when there’s some sort of extra “added value”, like your seating for the light show. This sounds great! 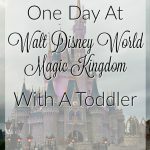 I have one ticket left in my 4-day pass and I plan on going to Animal Kingdom. I’ll have to check this out! For dinner and show that sounds perfect. The food looks amazing.